This treatise has been updated to include the most recent advances in research and the newest developments within the industry. As aquaculture remains one of the fastest-growing animal food-producing sectors, this reference becomes even more vital. 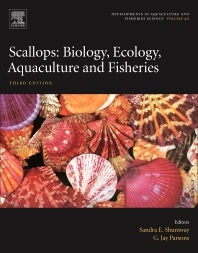 It has all the available information on scallops needed to equip researchers to deal with the unique global issues in the field. Dr. Jay Parsons has been involved in the aquaculture sector for 30 years and has extensive experience in shellfish aquaculture research and management. Since 2003, Dr. Parsons has been with the Aquaculture Science Branch of Fisheries and Oceans Canada where he is Branch Director responsible for national aquaculture R&D programs and aquaculture research coordination. From 1995-2003 he was a researcher and faculty members at Memorial University (St. John’s, Newfoundland, Canada) where he taught graduate courses in shellfish aquaculture and directed several national and international projects, graduate students and publications on culture, feeding and reproduction in scallops, oysters, mussels, sea urchins and shrimp. He is also a past president of the World Aquaculture Society (WAS) and has served on the WAS Board since 2001. He was also President of the National Shellfisheries Association (NSA) and twice President of the Aquaculture Association of Canada (AAC). And he still maintains an active involvement in these professional societies through the promotion and dissemination of aquaculture science nationally and internationally.